Feral cat caretakers and city officials are looking for a new home for a pack of feral cats that live in Hudson Yards. HUDSON YARDS — These furry hold-out residents won't be getting a cushy buyout from the landlord. Feral cat caretakers and city officials are looking for new homes for roughly 20 wild cats that currently live in a vacant lot and adjoining a wooded area on the north end of Hudson Yards Park and Boulevard. 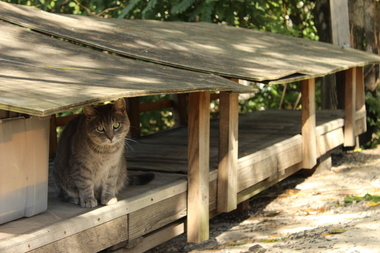 "The idea [is] to start planning now so that the cats will be safe," Kathleen O’Malley at the city's NYC Feral Cat Initiative, who said that encroaching construction on all sides of the site as well as potential redevelopment of the lot itself put the cats territory in jeopardy. "We’re just being forward thinking." On Monday, Councilman Corey Johnson who represents the Hudson Yards visited the feral cats and pledged to keep them safe and healthy on Twitter. Johnson plans to scout for new homes for the cats and possibly reach out to community gardens in the area that might be willing to take some of the cats in, the councilman's chief of staff, Erik Bottcher, said. The future of the plot itself remains unclear though Crain's reported in June that developer Tishman Speyer was on track to purchase the property from its current owner. Tishman did not immediately return a request for comment. Meanwhile, where the wild pride should live, as construction creeps closer and closer towards their sanctuary, is up for debate. "They’re not adoptable, there's no warm fuzzy solution," said Michael Phillips, director of the Urban Cat League that's been caring for the felines since 2006. "But they could be very easily [reintroduced] right there within the project confines." Back in 2006, when Phillips, who calls himself a "cat lady," started working with the Hudson Yard strays, he trapped about 75 cats from the lot, he said. Around 40 were young kittens that they managed to tame and find adoptive homes and 30 adult cats were spayed and neutered and released back to the lot. After nearly a decade of work, the cat population is down to 20 cats and a kitten hasn't been born there for five years, he said, though each year a handful of new cats end up at the lot, sometimes about to give birth. "Cats are here to stay, they're here because of our negligence," Phillips said. "We’re duty-bound to do right by them."